Tech Mahindira : Wanted Candidates for Firing! Muthukumar is a software Engineer based out of Chennai working in Sholinganallur. He is being terminated from his company citing performance issue. Ashwin is his human resource officer who facilitates the termination process on behalf of the company. Muthukumar went to Ashwin residence located in Egmore and attempted to murder Ashwin with a sickle. Luckily people gathered after hearing the sound and saved Ashwin. He is later admitted in Rajiv Gandhi Hospital. 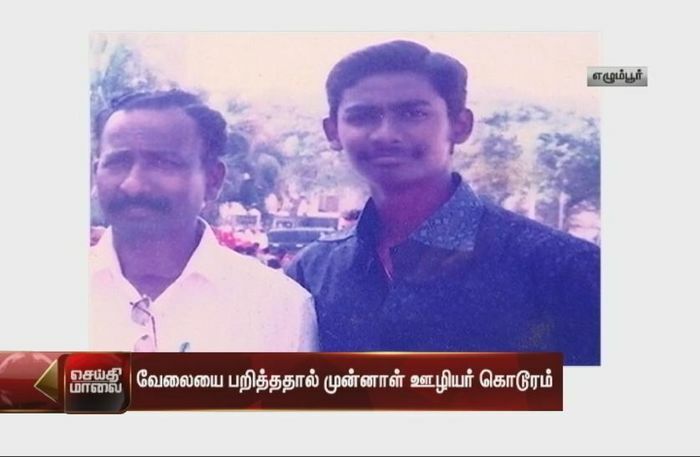 Muthukumar is arrested by the local police. 2 months before there was a similar incident of Human resource officer attempt to murder based out in Guragon. Binesh Sharma, HR head of Mitsuba which is a Japan based company was going to his office in his car. Sacked employee of his company named Joginder opened fire after following HR officer in 2 bikes with his relatives. Joginder was sacked a few days back from Mitsuba over his alleged “unprofessional behavior”. Joginder threatened Sharma of dire consequences but the HR head did not take this warning seriously. Sharma suffered two gunshot injuries. Sharma managed to drive the car with gunshot injury and reached office escaping from further attack. Later Sharma was admitted in hospital and treated for his injuries. In this incident also, Joginder is arrested and sent behind bars. As a part of NDLF, we regret such incidents. Definitely IT employees cannot achieve anything through this individual attacks. We have repeatedly explained the problem from Human resource officer side. We insist that they are also our fellow employees who are getting paid like any one of us. Some HR officers support us in the journey of helping employees against layoff. Instead of directing the anger at individual HR officers, we should organize in the union and struggle against the bosses of HR and their bosses who make the lay off decision and set the targets and make them change their ways. 1) Many of HR officers are also in the age group of 25-35. They are given desired target on sending employees out based on management orders. They are not given any choice to rescue employees here and if they did not meet the layoff target, it affects their growth and career and they may even be fired. 2) Layoff is not done based on HR officer’s own wish. Many of the HR officers mentioned that they are very negatively influenced by this act. 3) There are layoffs happening in HR side also. As an employee, we are covered under Industrial and Disputes Act. But many HR officers if they are terminated, cannot appeal to legal dispute due to the loop holes in the legal system. 4) They are also getting single digit hikes and they are cornered by both employee side and management side for the work they did like drum beaten on both side. 5) They also have family like any one of the other employees and they do this for their bread and butter based on the management direction. 6) Their role is like a hangman in the prison. If judge gives the order, it is the responsibility of hangman to perform the execution. If he refuse to do that, system will replace the hangman with new person. But hanging will not be stopped and it will be continued with new hangman. 7) So having grudge on individual HR officer and manager is completely not correct. It should be directed against the company’s policies. On the other side, there are media reports that 8000 IT employees committed suicide in the last few year sdue to job threat. So HR officers should also put themselves in employee shoes and help employees whatever way they can based on limited boundary they have. As we already mentioned, for the tiger it is one day meal but for the deer it is his life problem. So HR officer also should not have personal grudge on employee resisting to resign. IT employees should understand that both attacking HR officers and suicide are not giving any solution to the problem but it will complicate it more. On other side, it is confirming that people committing this suicides or attacks are underperformers as defined by the management. So build the courage to fight against layoff threat. We have published various articles for the welfare of IT employees to help them to face layoff challenge. They can use this awareness and contact our NDLF IT wing to protect them from layoff challenges. The biggest challenge for IT employees is that unfortunately most of the people are more selfish and not having much courage to take up the fight. If an employee switches company with less than 10 years of experience, he/she may be getting even 50-80% hike at current market situation. This gives a feeling to the employees that they are supreme and they can get high salaries based on their skill set. But unfortunately when they reach above age of 35, many companies don’t want to retain them or recruit them. This makes the employee fall from super hero stage to super zero stage and that’s the main reason for increasing number of suicides. Young generation of employees feel that unions are not required for them and they don’t care about unions as they are getting new jobs easily. The only way to solve this issue is for more and more junior employees should come forward and join the union. This is the paradigm shift required and if this happens, it ensures the safety of IT employees and we will be having better life in IT industry. People should understand that labor unions are not bad word and unions exist in all other sectors and they are fight for the welfare of employees. Human resource officers should also understand the role of labor unions in facilitating tough situations. Definitely human resource officers in other sectors know the importance of labor unions as they read about the benefits in the curriculum. HR should not have any personal grudge and should come forward to support unions. I hope this paradigm shift will happen soon and I am confident that NDLF will front run along with other labor unions in achieving this paradigm shift. This is not the right way of looking at things. Most of these problems are caused by the HR professionals and their higher ups who project rosy future and highly inflated salary package and recruit engineers for permanent positions when they know that project is for only 6 months-2 yrs. They include things like Tax, PF etc which never reaches employee but is projected a high number. Company does not give accomodation nor transport but all costs including health insurance, rent , school fee for children etc all transferred to employees. Many junior employees thinking that their job is lucrative, get married and make children. this type of behavior by HR affects not onlu employees but also their beloved family and children.Unless you can not give job for 30 yrs and a permanent job why open companies or hire employees. IT employees need to all get together, make Union and revolt against HR and Management like Sepoy Mutiny of 1857 and lay off all these HR folks and their higher ups, then things will come under control. These folks are promising wrong things for both clients and employees and then misleading them both. Mutiny needs to happen from both clients and also employees. No client wants employees to be unhappy. Nice and very thoughtful article. As a mid level employee of Cognizent, I support your thoughts . But you some of the cases the HR representatives goes on humiliating the employees beyond a limit and blackmail them through fear trick like “ we will give negative feedback to your future employer in case don’t resign now” etc etc. I am having the 1st hand experience and know at what extent this conversation can go. In fact in your recent post you mentioned one of the female Wipro employee was almost forced to resign before she leaves the HR bay. While this post is not to support physical abuse but to point the real situations. I am not sure about other organisations but in Cognizent lot of HR and recruitment group employees are on site. My point was not against HR professional but the dirty tricks they use both during recruitment and retrenchment. I mean we work for the company get paid, company makes huge profit by sending INDIAN engineers to USA or any other country. But with slight view of decrease in company profit, the 1st thing they throw us out ruthlessly and more importantly HR become the executioner, so they add more nuisance value on top of it. HR’s must realize and support the Unions after this kind of bad incident happened. When 2A case litigations are ending in reinstatement and job back in 3-12 months with back wages, What stops employee to file case ? Have gone through comments. The world is changing & one has to accept uncertainty in the world sportingly & drive to learn diversity in the life or develop passion with hard work to accomplish. This issue is also going to be faced by HR professionals once the people r reduced . This gives a way to introspect & inculcate to gain more diversified exp and confidence than money . I have shared my views & never had fustration eventhough i was scapegoat manytimes . What if it is a false case by Employer against employee or retaliating employee ? When bouncers are recruited by Verizon for resignation, Will HR have all possible contacts to all leaders Bouncers in Chennai ? What if it is a foul play by organization ? I think people when benefit from supply & demand position want free trade & when they are at receiving end,blame others. I would like to ask all those in IT profession on what grounds they were enjoying high salaries as compared to their counterparts in other fields? If you are not contributing to Company’s growth & profits why should you insist to be retained by the Company? HR ஒருவரை பணிநீக்கம் செய்யப்பட்ட முன்னாள் It ஊழியர் தாக்கினார் என்று செய்தி வெளியிடப்பட்டது..
எந்த ஒரு ஐடி ஊழியர் PM level resource ஆவது கத்தி கொண்டு பழிவாங்க செல்வாரா என்று தெரியவில்லை? உண்மை என்னவென்று ஊர்ஜிதம் செய்வதற்கு முன்னரே சம்பந்தப்பட்ட முன்னாள் It ஊழியர் புகைப்படத்தை எல்லா சேனல்லயும் ஒளிபரப்பி உள்ளனர்..